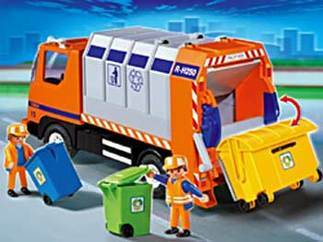 MB has been on a mission to find a toy rubbish truck for her favourite grandson, LJ, who is totally obsessed with all garbage collection machinery. She's visited all of the toy shops in Cairns, plus the usual department stores, to no avail. Amazingly enough an online search turned up Toymaster which is actually based in Cairns. Better still she can buy a Playmobil rubbish truck. MB has fond memories of her own children enjoying their Playmobil toys, in fact the grandchildren are still playing with the same toys which are now nearly 30 years old. MB also found on Google a Playmobil Airport Security Checkpoint set, quite hilarious what the toy boffins can come up with. The Security team needs Postman Patdown.